Tonight, at bedtime, you might want tell a child the stories about a secret giver of gifts, the real one…St. Nicholas of Myra. May we always be blessed with peace and prosperity…and abundance, so that we can share more with others in need. God bless you. friend of children, giver of gifts, climber of chimneys, &c.
Because of this and similar stories, Nicholas became a symbol of anonymous gift-giving. Hence, if we give a gift to someone today without saying whom it is from, it can be called "a present from Saint Nicholas." Pictures of Nicholas often show three bags of gold next to him, and often these bags have become simply three disks or balls. Stories have him saving the lives of three innocent men who had been condemned to death. Still other stories have him coming to the rescue of drowning sailors. Nicholas has always been popular with children, mariners, pawnbrokers, the Dutch, the Russians, and recently, the department-store owners. In many countries, Nicholas visits children on his feast day, 6 December, and brings them gifts then. In these countries, there is usually no exchange of Christmas presents, but there may be gifts again on January 6, the feast of the coming of the Wise Men, who brought gifts to the Holy Child of gold, frankincense, and myrrh. Almighty God, who in your love gave to your servant Nicholas of Myra a perpetual name for deeds of kindness on land and sea: Grant, we pray, that your Church may never cease to work for the happiness of children, the safety of sailors, the relief of the poor, and the help of those tossed by tempests of doubt or grief; through Jesus Christ our Lord, who lives and reigns with you and the Holy Spirit, one God, for ever and ever. Saint Nicholas is known as the childrens' saint. For many years, St. Nicholas has brought small gifts and rewards to children who were kind and helpful. A number of years ago, he began to distribute gifts to adults as well. St. Nicholas is usually pictured wearing a bishop's robe and mitre and carrying a bishop's staff. He goes out into German homes and takes gifts to the children. The gifts are loaded into a big sack which is carried by his helper. 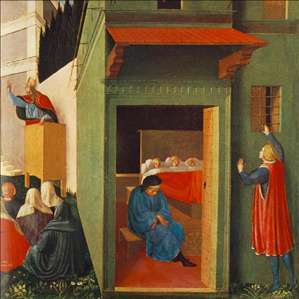 St. Nicholas often questions children about their behavior. He may ask about things such as their school work, their church attendance, and their willingness to obey their parents. Other questions may focus on their ambition or willingness to work rather than be lazy. Traditionally, children in Germany have been told many tales about St. Nicholas's helper. The helper may be dressed all in black, usually in furs, old clothing, or even rags. Some families threaten their children with the idea that this helper will either take back their gifts, leave them only a piece of coal in their shoe, or perhaps leave a switch or bundle of sticks for whipping if they do not behave properly. St. Nicholas and his helper have brought their gifts for children on December 6, St. Nicholas Day. The people in some areas of Germany do not expect St. Nicholas to pay a personal visit, but rather they put their shoes out when they go to bed on the evening of December 5th, and the saint pays his visit during the night. In those homes where shoes are left to be filled, they are usually found waiting near the fireplace if there is one available, or under the beds of the children, or even next to the stove or some other sort of heater. In some areas of Germany, St. Nicholas is called by other names, such as Rauklas, Bullerklassor, or Sunnerklas. His helper has even more names, and those names depend on where in Germany you happen to ask. Among the popular helper names are Krampus, Pelzebock, Pelznickel, Hans Muff, Bartel, Gumphinkel, Stoppklos, Black Pit, or very frequently Knecht Ruprecht. Over the centuries, many tales and stories have grown up about St. Nicholas and his helpers, and they make an interesting research project for youngsters.